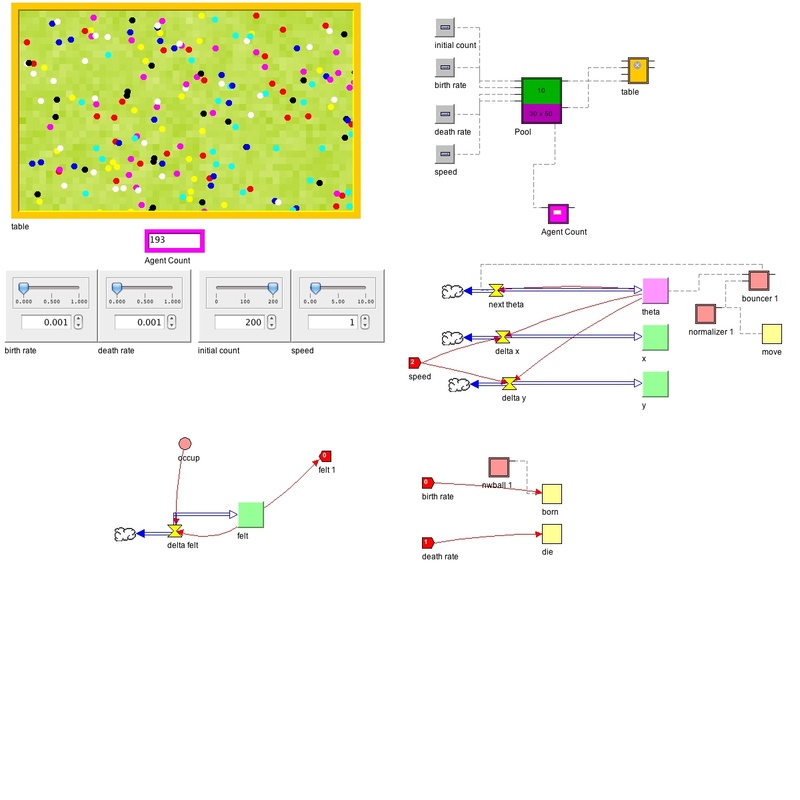 Billards is a semi-complex Sim World model where both agents and tiles are used. This model has two submodels: one for the balls (agents) and one for the surface (tiles). The balls roll in random directions from an initial point and bounce off the walls. As the balls roll across the surface, it becomes “degraded” and the color begins to fade. Boundary conditions are defined within the ball submodel. This makes the balls move in a very physical way. Interesting features of this model include the boundary conditions that are defined inside of the ball subclass which allows for the movement of the balls to behave in a very physical way. It is also worth noting that the getter in AgentViewerX is used in order to set the color scheme to be keyed to the value “felt” contained within the surface (as you may recall from the AgentSIR tutorial, a “getter” is a value passed through a display to tell the display what the color is). This connects the color of the tiles to the value within the stock, which allows the colors to change over time. This is also a good example of sliders being used at the top level in order to control the parameters of an agent based model.